”Using simple and functional components, Zimoun builds architecturally-minded platforms of sound. Exploring mechanical rhythm and flow in prepared systems, his installations incorporate commonplace industrial objects. In an obsessive display of curiously collected material, these works articulate a tension between the orderly patterns of Modernism and the chaotic forces of life. In an obsessive display of curiously collected material, these works articulate a tension between the orderly patterns of Modernism and the chaotic forces of life. Woodworms eat themselves a way through a piece of wood that is lying on the floor in a closed room. The sound of the eating woodworms inside the piece of wood is amplified in the room and creates an immersive sound. 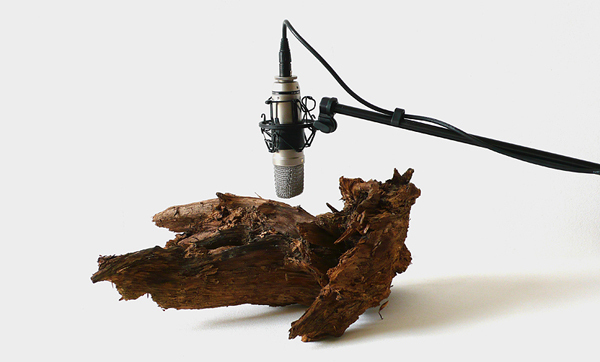 The work audifies the – for the audience invisible – process of how the woodworms dig a network of tunnels through the wood. Temperature, humidity and other environmental qualities determine how the wood worms perform and shape the piece of wood. Zimoun, born in Switzerland in 1977, is a self-taught artist based in Bern. His work has been presented in solo and group shows as well as performances in Europe, North America, Asia, Africa and South America. Zimoun has been awarded different art prizes and residencies and has served as a guest lecturer. Recent displays of his work include exhibitions at the Nam June Paik Art Center in Korea; the Kuandu Museum of Fine Arts, Taipei; Art Basel; Galerie Denise René Paris; the Ringling Museum of Art, Florida; bitforms gallery New York; Kunsthalle Bern; Kunstmuseum Liechtenstein; the Contemporary Art Museum MNAC Bucharest, among others. In 2003, Zimoun and graphic designer Marc Beekhuis founded Leerraum [ ] – which has become a platform for creative exchange among artists, designers, architects,… who explore forms and structures based on reductive principles and careful yet radical use of materials.